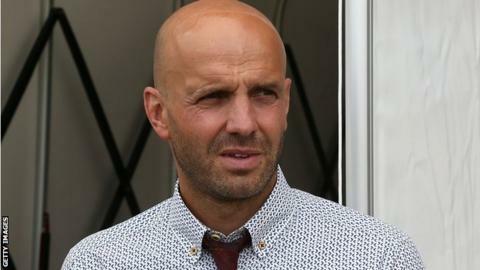 Exeter City boss Paul Tisdale says he is "not losing any faith" in his squad after their 3-0 loss at Northampton. It was Exeter's first loss of the season, after wins over Yeovil and then League One Swindon in the League Cup. "I'm not losing any faith with the players and how we've started the season," Tisdale told BBC Radio Devon. "One or two were below par but one or two played particularly well as well, so I'm certainly not going to be too disappointed." Exeter are in action again on Tuesday when they go to Dagenham & Redbridge, who are bottom of League Two. Tisdale has been in charge at St James Park for more than nine years. Of the 92 managers in English football's top four divisions, only Arsenal's Arsene Wenger has been in his post for longer. "We know what we do, we know how we play and we're not going to get it right every time," added Tisdale. "It wasn't a great day for us but I've been here before. "We've got one or two that are probably slightly under their match levels of fitness. We've got to get them up to speed and then we can start using the squad a bit more."